Quality Entertainment inquired about applying some of our vinyl to their white wedding dance floor in the "Inspiration" section of the show along with other great local vendors who were displaying their inspirational wares and talents, like Groovy Linen Rentals whose colour choices were a perfect fit with our Dark Brown Wedding Dance Floor decals. We can not say THANK YOU enough times, for giving us this opportunity. 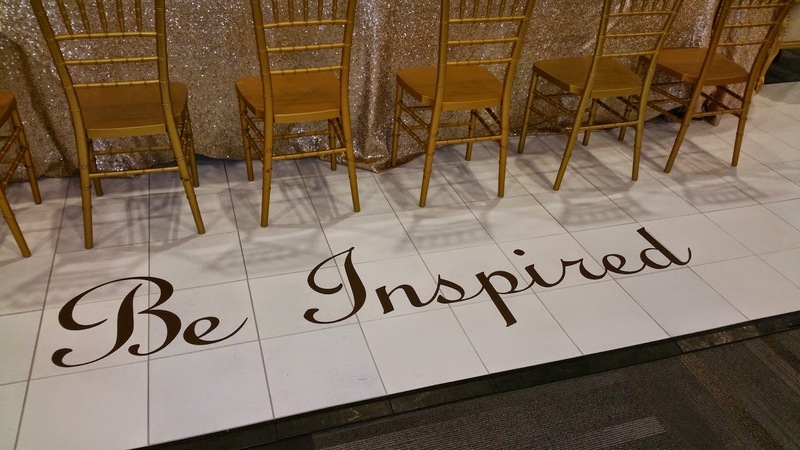 Applying custom and personalized vinyl to a wedding dance floor is relatively "new" and is still a little known option for weddings at this time, but it is something that we have been showcasing whenever possible as one more option to help personalize your wedding day, along with the many other ways our vinyl can be applied to your special day as well. Again thank you to Scott and Bryan over at Quality Entertainment! please visit us over on our Facebook page if you were at the show and had snapped a picture of the vinyl and look for the offering to get a rebate off your next sparklingexpressions vinyl purchase.